Welcome to Global Prices’ day-by-day blog of our family round-the-world trip from August 2009 to June 2010. Please use the links on the right to browse our posts and read about our travels. The RTW Families tab links to our searchable database of globe-trotting families; please let us know of any additions to this list so that we can keep it up to date. If you are contemplating a similar adventure with your family and you’d like our opinion or advice on anything, then do get in touch – we’d love to hear from you. I’m more excited because this is a rare tangible outcome of our trip; otherwise daily life tends to go on much as it did before with little direct evidence that we ever went away for a year. I’m not likely to win a camera or a trip to Australia (we used a little point-and-shoot while just about everyone else there will have fancy DSLRs) but at least there’ll be a portion of wall-space devoted to one of our pictures, one choice public morsel plucked from our family round-the-world feast. Well, we’re certainly doing that thing of ‘one year ago today we were…’ – and we have astonishingly clear recollections of each and every day of our trip, going beyond what is mentioned in the blog. A real sense of being there, inside the picture rather than just looking at it. That hasn’t happened for any other extended period of my life that I can think of. On the downside, we’ve lost our immunity while away and so we’ve been going down with every cold virus around, often getting two or three bugs back to back. There again, we’ve been spending far more time indoors (given the freezing weather) than during our travels, and three of us can pick up things from being at school all day. Two photographic successes from our 15,000 images: Ellen’s picture of the landscape seen from the train to Machu Picchu got her shortlisted as one of the best five out of over a thousand entrants in a National Geographic Kids competition, and my serendipitous snap of a man carrying salt through the sepia-toned pans at Maras got me into the best fifteen for the Wanderlust photo contest. Don’t know yet if it’ll make the exhibition at the Destinations Show in London this February. 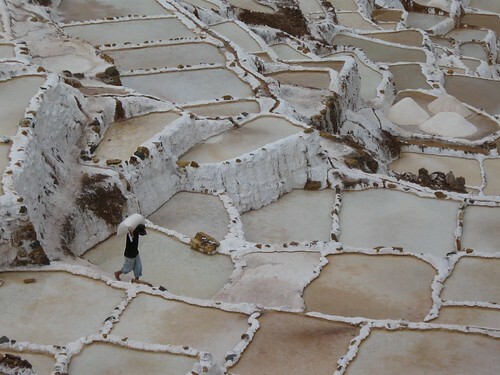 Salt pans at Maras, Peru. Otherwise, how has our life changed? A lot more walking to and from school, rather than driving (while weather and health permit). No great desire to surround ourselves with clutter – most of our pre-trip possessions remain in the loft, and need sorting/clearing out at some point. And there are so many occasions when items of news from around the world take on an extra resonance; we weren’t that far from the Chilean or the New Zealand miners, for instance. We are also still ‘travelled out’, though, with no burning desire to get away yet (despite the continuing freezing weather), although we miss the long hours of sunshine we had last winter. So what have I been up to since we got back to the UK? Spending even more time in front of a screen than usual, sadly. I’m back to work, constructing next year’s school timetable – which involves sitting at a computer all day. Then I come home to sort through the 15,000 photographs we took during our trip, selecting the best ones and assembling them into a photobook – i.e. even more sitting at a computer. And when I need a break from it all there’s the World Cup and Wimbledon – on television. Anyway, earlier today I completed a nice 160-page coffee-table book of our choicest images, and by the wonders of the internet you can have a sneak preview below – you can even purchase a copy if you’re feeling flush. The next project is to convert this entire blog (text and all) into a book; early indications are that it will fill two 400-page volumes. This is the terminal one; the last blog entry of our trip. We’ll probably do a few dribs and drabs about readjusting to everyday life back at home, but here ends the daily grind of the daily diary. You set out intending to give an account of your travels and you end up giving an account of yourself. Ten different people could take exactly the same route, have exactly the same experiences, and yet they would still tell ten different versions of that reality. I think it was Borges who wrote of a man who sets out to draw a detailed map of the entire world, only to realise on his deathbed that he has traced the lines of his own face. But it is also true that if we were to retrace our steps exactly, starting this August, we would be recording such a different trip. You’re at the mercy of circumstance, the weather, the people who cross your path. The Blue Mountains might be gloriously sunny, we’d miss the Flying Wallendas, we wouldn’t be in Bali for the big festivals. We might succeed in riding elephants or catching some fish, we could lose more than just an empty bag from our room. ‘I am not worthy, not qualified’ has been a recurrent regret. My ignorance shames me, and so many privileged moments must have been wasted on me. I am not enough of a naturalist to appreciate all I have seen in jungles and rainforests; I am not enough of a motor racing fan to be drawn to Adelaide’s V8 and Kuala Lumpur’s Grand Prix; I am no diver and yet we have stayed in some enviable locations. How much more would others have made of our itinerary? Don’t get me wrong; we’ve had an amazing time and we have no regrets whatsoever. It’s surely the richest year (in so many respects, bar the financial) we’ll ever have. That I like the wilderness; my favourite spots have been in the middle of nowhere. 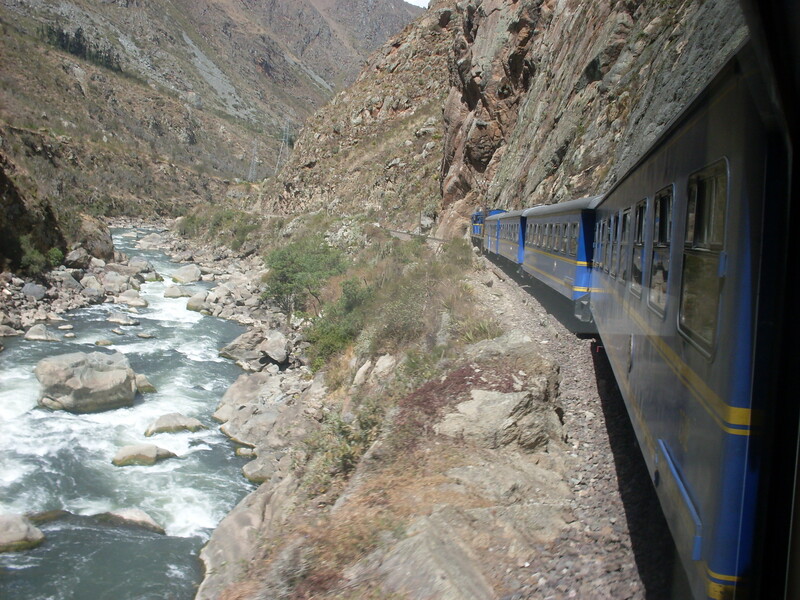 The beauty, solitude and challenge of the Inca Trail made a powerful impression on me. Easter Island was a very special place to visit and I have vivid recollections of the landscape which easily outweigh the monetary miseries of the time. The Bolivian salt flats, the Red Centre of Australia; both exude a mesmerising ‘otherness’. By contrast, cities the world over are all alike, superficialities aside. That children are astonishingly resilient and can cope as well as (or even better than) adults in most situations. The girls have the stronger stomachs when it’s a rough sea; if they find a trek tough going then my feet are probably in agony too; they can return from a full day’s exploring and still have energy to play while the adults crash out. Hannah and Ellen have maintained a daily diary since November, while Kirsten and I have shared the blogging load between us. Boring flights, late nights, mosquito bites, scary heights – the girls have taken all the inconveniences, annoyances and challenges that travelling has thrown at us and made light of them. It’s a sobering thought that this year will probably be the only period in our lives that the four of us are together all day, every day, month after month, with no school or job to come between us. And it’s worked out so well; we’ve had such a happy and (mostly) relaxed time, we haven’t driven each other up the wall, the girls rub along more easily with each other and with us than ever before. I am grateful to have had Kirsten alongside me to share the highs and lows of this adventure; I couldn’t have done this without her (quite literally). One of our pre-trip puzzlers was whether we would return home fitter or fatter: the answer is fitter (and the adults have lost weight, too), thanks to the active nature of our travels – we’re always off for a swim or popping out on foot to get something or dragging rucksacks from one hotel to the next. Health-wise we’ve been no worse off than we might be at home: okay, maybe not Ellen’s jellyfish sting, but we’ve had fewer colds and not too many tummy upsets, and nothing requiring a visit to a doctor or a hospital. As for the $64,000 question, the answer is probably not that far away from $64,000, or a bit more than £40,000. (You know, how much did this whole exercise cost, including flights, kit, insurance and everything?) Yes, it’s a lot of money – the fruits of years of frugal living and careful saving – but as I wrote before we left, some people spend this much on a new car or a new kitchen. And for us, a round-the-world trip is the better investment. I haven’t had time to do the detailed sums yet, but I do know that accommodation has made by far the largest hole in the wallet. We could have economised here, but you have certain minimum standards if you’re travelling with children (for reasons of security, cleanliness and comfort). What now? Where do we go from here? A round-the-world trip certainly leaves you with the awareness that your life does not have to run the conventional and expected course, and that an alternative mode of existence need not necessarily be dangerous or ill-advised, even with children in tow.